Brigadier General Thomas L. Tinsley was Commander, 3rd Wing, Elmendorf Air Force Base, Alaska. The 3rd Wing provides the Commander, U.S. Pacific Command, trained and equipped tactical air supremacy assets with all-weather strike capability, command and control platforms, and strategic airlift resources for contingency operations. The wing flies the F-22A, F-15C, C-17, C-12 and E-3, and maintains a regional medical facility providing care for all forces in Alaska. The installation also hosts headquarters for the 11th Air Force, Alaskan Command and Alaskan North American Aerospace Defense Command Region as well as 41 tenant units. General Tinsley was commissioned in 1984 through the ROTC program at Embry-Riddle Aeronautical University and subsequently was a distinguished graduate of undergraduate pilot training. He has served as an F-15 instructor pilot, F-15C test pilot, wing weapons officer, exchange officer and instructor with the Royal Australian Air Force. He has served in the Directorate for Plans and Policy on the Joint Staff as South Asia desk officer and executive assistant to the Deputy for Political-Military Affairs for Asia Pacific and the Middle East. He has commanded the 12th Fighter Squadron, Elmendorf AFB, and the 1st Operations Group, Langley AFB, Virginia. Prior to his current assignment, he was Executive Officer to the Chief of Staff of the Air Force. The general is a command pilot with more than 3,200 flight hours in the F-15, F/A-18 and F-22A. 12. July 1998 - February 2000, South Asia desk officer, Directorate for Plans and Policy (J5), Joint Staff, the Pentagon, Washington, D.C.
13. February 2000 - August 2000, executive assistant to the Deputy for Political-Military Affairs for Asia, Pacific and the Middle East, Directorate for Plans and Policy (J5), Joint Staff, the Pentagon, Washington, D.C.
18. August 2005 - May 2007, executive officer to the Chief of Staff of the Air Force, Headquarters U.S. Air Force, Washington, D.C.
Brigadier General Thomas Tinsley was declared dead last night at 10:30 p.m. following an apparently self-inflicted gunshot wound to his chest. It’s unclear whether the shooting was accidental or a suicide. Tinsley was the 3rd Wing Commander at Elmendorf Air Force Base since May 2007. Air Force Institute of Pathology investigators are in route to Alaska and will make the final determination about his death. General Tinsley is survived by his wife and daughter, both of whom were in the home at the time of his death. He was also the legal guardian of his teenage nephew. Plans are coming together for the memorial of Brigadier General Thomas Tinsley. The general was found dead in his home on Elmendorf Air Force Base Sunday night. Tinsley was the top commander at Elmendorf. He reportedly died from a self-inflicted gunshot wound. But investigators do not know whether or not the deadly shot to the chest was an accident. A memorial service for the general is set for Thursday. It's set to be held in hangar One on Elmendorf at 2 p.m. The memorial is open to all who would like to attend. Also military officials are asking mourners not to buy flowers; instead they want donations to be made to the Mother Lawrence Foundation. ANCHORAGE, Alaska -- Elmendorf's commander will be honored later this week in a memorial service on base. Brigadier General Thomas Tinsley was found dead in his home Sunday night. Tinsley died of what appears to be a self inflicted gunshot wound to the chest, according to Air Force officials. They say no note was found. Representatives of the Armed Forces Institute of Pathology will make a final ruling on the cause of death. A memorial service for the brigadier general will be held 2 p.m. Thursday at hangar one. The service will be open to the public. A memorial service has been scheduled for Thursday to honor Brigadier General Thomas L. Tinsley, the commander at Elmendorf Air Force Base, Alaska, who died Sunday of an apparent self-inflicted gunshot wound. The service, which is open to the public, will be held at 2 p.m. local time in Elmendorf’s Hangar 1, according to an Air Force announcement. All base gates will be open to the public from noon to 2:30 p.m. for those wishing to attend the memorial service. Tinsley’s death is assumed to be a suicide, said Colonel Richard Walberg, who assumed command at Elmendorf after Tinsley’s death, at a press conference Monday. Tinsley, commander of the 3rd Wing, suffered a gunshot wound to his chest late Sunday night and was pronounced dead within a half-hour. “To the best information, it’s possible it was a self-inflicted gunshot wound,” Walberg said. Medical responders rushed to Tinsley’s home on base but were unsuccessful in trying to save him. Tinsley’s wife and college-age daughter were home at the time of the shooting. 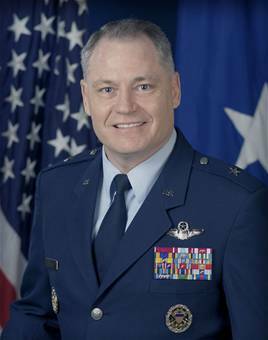 Tinsley was named base commander in May 2007. He had served as an F-15 instructor pilot, F-15C test pilot, wing weapons officer, exchange officer and instructor with the Royal Australian Air Force. His previous 22-month assignment was as executive officer to the Air Force Chief of Staff, General T. Michael Moseley, who resigned under pressure in June 2008. Defense Secretary Robert M. Gates ousted both Moseley and Air Force Secretary Michael Wynne, holding them accountable for failing to fully correct an erosion of nuclear-related performance standards. Walberg said Tinsley was not under investigation or undue stress. Walberg lives across the street from the base commander’s home. He and his wife went to bed at about 10 p.m. Sunday and the base command post called about 10 to 15 minutes later. The colonel bolted out of the house with his wife behind him and met Colonel Eli Powell, the 3rd Medical Group commander and an orthopedic surgeon, inside. Powell, who lives next door to Walberg, had also received a call. He started resuscitation efforts on Tinsley as family members watched. Tinsley was declared dead at 10:30 p.m. Representatives of the Armed Forces Institute of Pathology will do a report and declare Tinsley’s cause of death and determine whether it was a suicide, Walberg said. “We’re assuming it was, and I’m not prepared to make that statement,” he said. A report takes an average of 30 days to complete, he said. Tinsley’s outstanding achievement was the care he showed for those under his command, Walberg said. Walberg recalled his first contact with Tinsley 18 months ago. Over the phone, Tinsley introduced himself as “Pugs,” his fighter pilot call sign. The fighter pilot and the transport pilot traded good-natured barbs. “And he was always right because he was a general and I was a colonel,” he said. Brigadier General Thomas L. Tinsley, commander of the 3rd Wing here, died of a gunshot wound July 27 at his on-base residence. Elmendorf medical authorities responded and General Tinsley was declared dead at approximately 10:30 pm July 27. The general had served as the Wing Commander here since May 2007. "I'd like to express my personal grief at the death of one of our nation's finest Airmen, Brigadier General Thomas Tinsley, and to offer my profound sympathy to his wife Joanna and their family." said General Carrol H. "Howie" Chandler, Pacific Air Forces Commander. 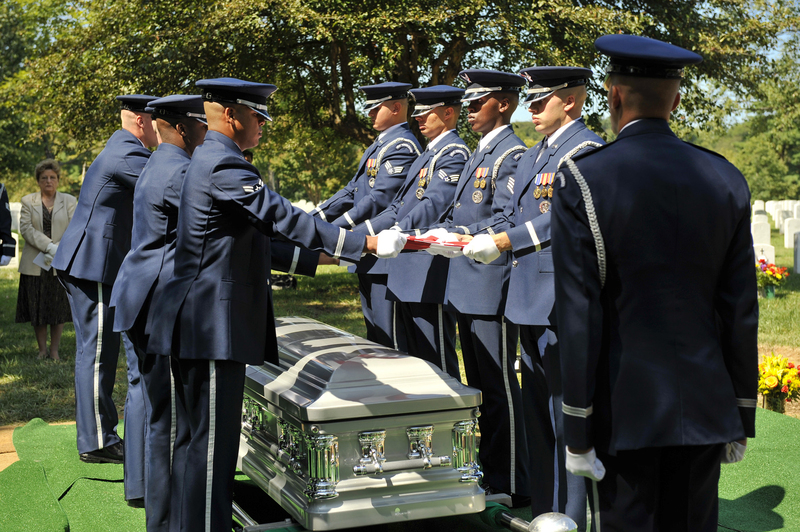 "General Tinsley was a true leader and Airmen warrior and his untimely death is a loss to the Air Force and the nation as well as to his family." General Tinsley was commissioned in 1984 through the ROTC program at Embry-Riddle Aeronautical University and subsequently was a distinguished graduate of undergraduate pilot training. 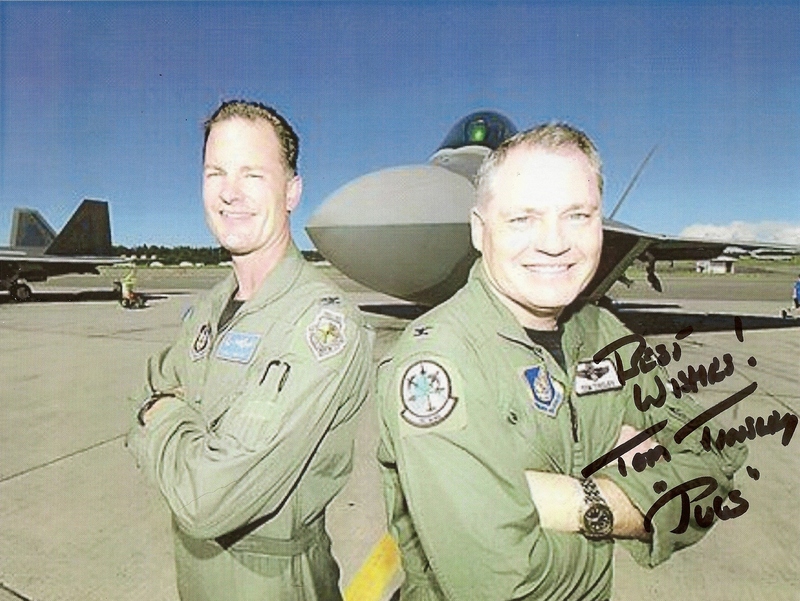 He has served as an F-15 instructor pilot, F-15C test pilot, wing weapons officer, exchange officer and instructor with the Royal Australian Air Force. He has served in the Directorate for Plans and Policy on the Joint Staff as South Asia desk officer and executive assistant to the Deputy for Political-Military Affairs for Asia Pacific and the Middle East. He has commanded the 12th Fighter Squadron, Elmendorf AFB, and the 1st Operations Group, Langley AFB, Virginia. The incident is under investigation and more information will be provided as it becomes available. 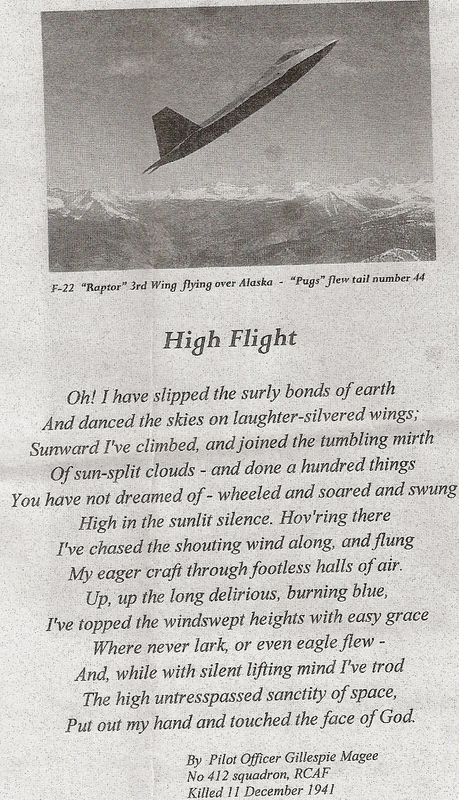 ELMENDORF AIR FORCE BASE, Alaska -- Many here are confused by the sudden death of their friend, mentor and commander Brigadier General Thomas Tinsley. He was compassionate, magnetic and charismatic said the airmen and women of Elmendorf, remembering Tinsley at a memorial. Tinsley died Sunday at his home of what appears to be a self-inflicted gunshot wound. Investigators are still determining the cause, though they said they do not suspect foul play. Thursday, the base remembered Tinsley for the man he was and his impact at the base. "It's never right to let a single event define the legacy of a great man's life," said Tinsley's pastor Dan Jarrell. For a little while, the questions were put on hold to honor and celebrate the life of the man that inspired hundreds of airmen and woman. "This guy, he's got so much responsibility at the base, and he took time out of his busy day just to come say hi and congratulations," said Senior Airman Matt Hulsman. "It's just mind blowing." They told stories, some more upbeat than others. "He was always trying to make things better for his troops, and I think we all saw that and really appreciated it," said Sgt. Michael Whitehead, who worked with Tinsley. From coworkers to higher-ups, Tinsley made an impression. "He was probably the biggest computer geek that I know," said General T. Michael Moseley, former Air Force Chief of Staff. And while many shared tales and thoughts with each other, those closest to him coped by talking directly to Tinsley. "Well Bud, you taught me good," said Tinsley's wife Joanna. "I'm independent, I'm strong, I'm worldly, and I'm going to make it. I'm a bit worried about the computer, but it's nothing a geek can't fix." So they remember him, the man some call Pugs or Bud, a charismatic commander that's still flying in the skies above. The plans are to bury Tinsley at Arlington National Cemetery in about a month. The family has understandably been pretty quiet about this situation, but they released a statement Thursday. In it, they talked about Tinsley's passion for his country and airmen, as well as his dedication for his family. His family said he was and always will be defined as a great man and a true hero. General T. Michael Moseley, former Air Force chief of staff, worked with Brigadier General Thomas Tinsley in Washington, D.C. Moseley was also a longtime friend who shared many stories about Tinsley at his memorial service July 31, 2008. Washington, D.C. Moseley was also a longtime friend who shared many stories about Tinsley at his memorial service July 31. 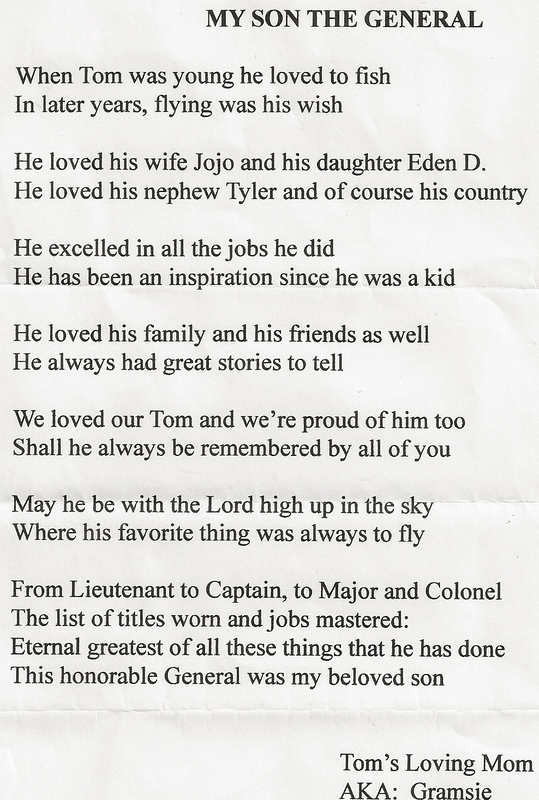 Brigadier General Thomas L. Tinsley, 45, well-respected Elmendorf Air Force Base commander and pilot, was known as an intelligent man, compassionate leader, computer geek, rancher at heart, lover of good music, and a man of big faith and bigger love. Tinsley died July 27 at home from a self-inflicted gunshot wound to the chest. 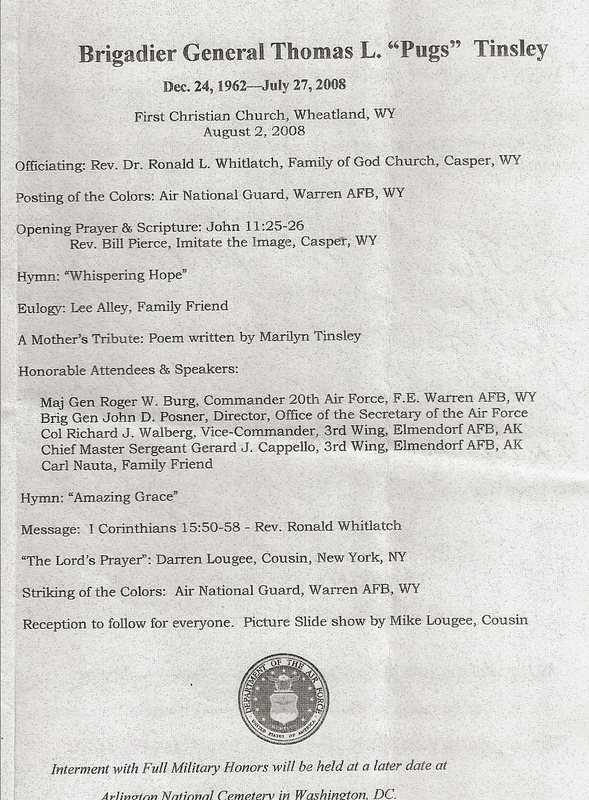 Moseley delivered a eulogy about Tinsley in front of 2,000 people July 31 at Elmendorf's Hanger 1. He told stories about the general that many people didn't know, such as one about how Tinsley grew up on a cattle ranch and liked to talk about the cattle market. He would put a cattle futures ticker on Moseley's computer desktop — just because he could. Moseley got used to the sounds of barnyard animals on his computer — sounds everyone in the in his Washington, D.C., office could hear, as well as the sound of a F-22 engine screaming before takeoff when Moseley started up his computer. It was Tinsley's way of adding a little humor to a demanding job at the national headquarters. Tinsley's wife, Joanna, called her husband of more than 23 years “Bud” and he called her “JoJo.” She said he had graced her life with love and humor. He brought his wife coffee in bed every morning and told her how gorgeous she was. He must've overlooked her morning breath and hair, she said. “He held me every night and loved me like it was the first time,” Joanna said. The Tinsley family's pastor, Dan Jarrell, told the audience that death never makes sense, but Joanna, daughter Eden, nephew Tyler and other family members were finding peace in the shadow of God's wing and in their faith. Tinsley's staff remembered him as kind and intelligent. Staff Sergeant Michael Whitehead, the mechanic for Tinsley's F-22, said he was always concerned about his troops and their families. Tinsley was known for being intelligent, but also as a gentle human being. “He never made you feel belittled at any time. He always made you just feel good,” Whitehead said. 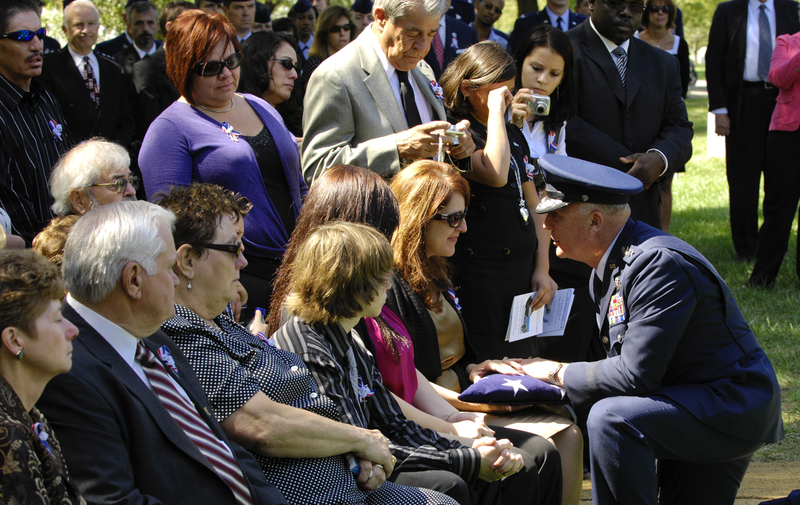 In the office Senior Airman Amy Nevins remembered him as being kind. She said once she stood up when he walked in the room, as you do for anyone of his rank, and hit her head on a cabinet. Tinsley rushed over and parted her hair looking for an injury. An embarrassing moment, Nevins said, but one that showed what kind of a person he was. The memorial was a celebration — the band played Tinsley's favorite songs, and a love song for Tinsley and his wife. At the end of the event Col. Richard Walberg, who is now Elmendorf's commander, teared up when it was time to hand Joanna the American flag. Tinsley was also posthumously awarded the Legion of Merit. Moments later, planes flew over the hanger in honor of Tinsley. A F-22 flew straight up in the air into the clouds. 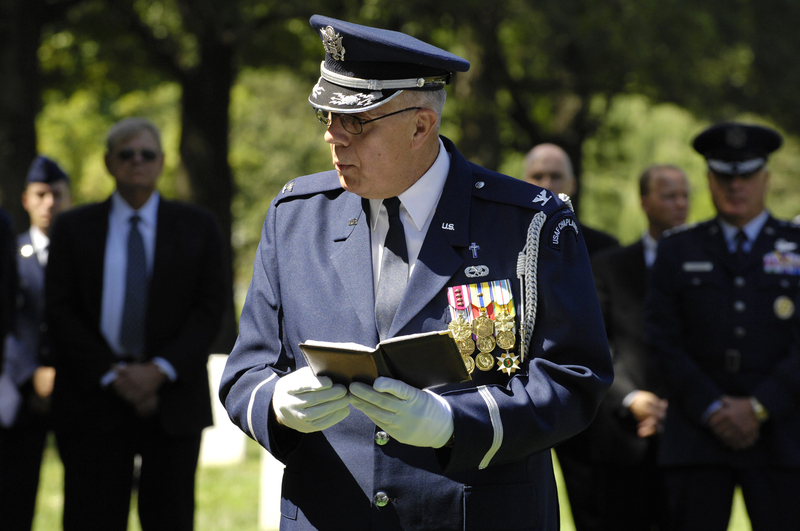 Brigadier General Thomas L. Tinsley, who died July 27, 2008 of a self-inflicted gunshot wound, will be buried with military honors at Arlington National Cemetery on September 10, 2008, at 11:45 a.m. Eastern time. Tinsley, commander of the 3rd Wing at Elmendorf Air Force Base, Alaska, apparently shot himself in the chest, though it is not yet known if the shooting was suicide or an accident. He is survived by his wife, daughter and a nephew for whom Tinsley was the legal guardian. The 46-year-old fighter pilot was pronounced dead within a half-hour of the shooting at his home on base. The Air Force has not said if the death is thought to be a suicide and is not commenting pending the results of an investigation that will take 30 to 60 days. Medical responders rushed to Tinsley’s home but were unsuccessful in trying to save him. Tinsley’s wife and college-aged daughter were home at the time of the shooting. His previous 22-month assignment was as executive officer to then-Chief of Staff General T. Michael Moseley, who resigned under pressure in June 2008. 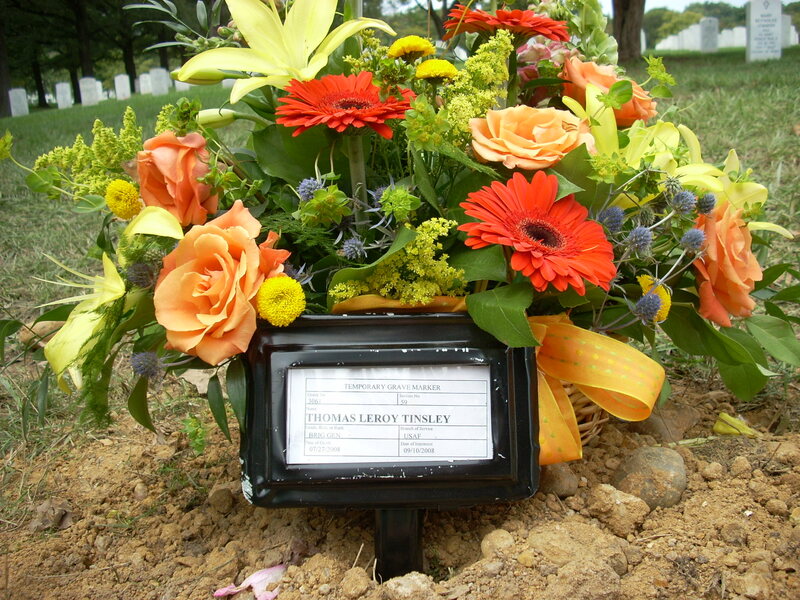 NOTE: General Tinsley was laid to rest in Arlington National Cemetery on 10 September 2008. 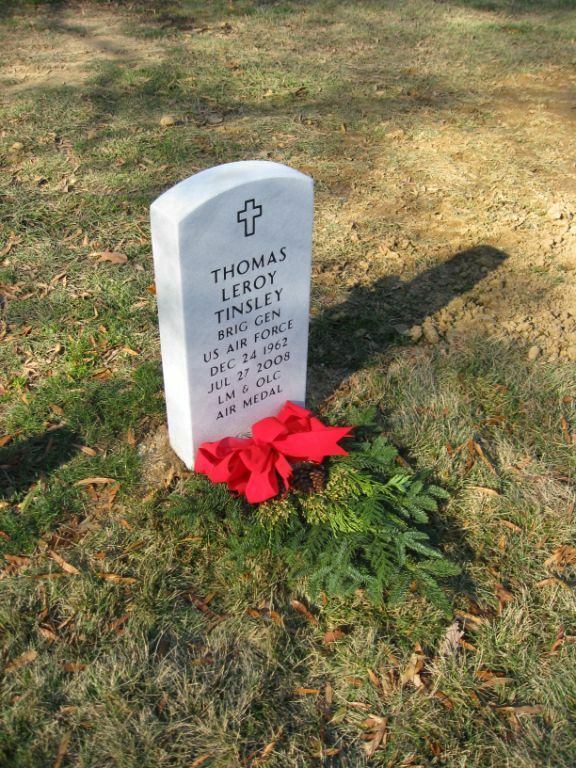 Brigadier General Thomas L. Tinsley, who died July 27, 2008, of a self-inflicted gunshot wound, was laid to rest Wednesday at Arlington National Cemetery. 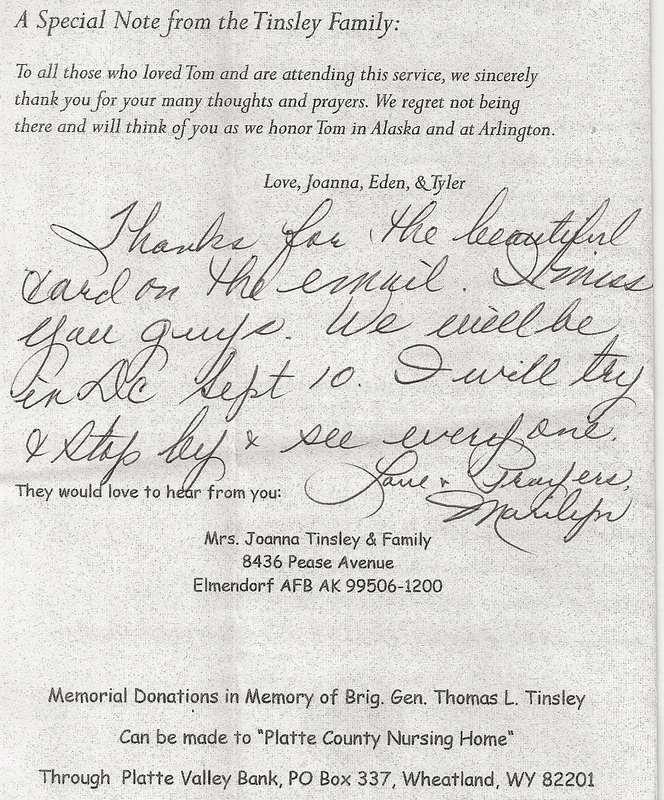 Leaders from Elmendorf attended the funeral, as did his wife Joanna, daughter Eden and a nephew Tyler, for whom Tinsley was the legal guardian. The Air Force is not commenting on Tinsley’s death until it finishes its investigation, which will take 30 to 60 days. Medical responders rushed to Tinsley’s home but were unsuccessful in trying to save him. Tinsley’s wife, and college-aged daughter were home at the time of the shooting. His previous 22-month assignment was as executive officer to then-Chief of Staff General T. Michael Moseley, who resigned under pressure in June. The July 27, 2008, death of Brigadier General Thomas Tinsley by self-inflicted gunshot wound seems likely to remain shrouded in mystery. A three-month Air Force Office of Special Investigations inquiry, which concluded in early November, determined that Tinsley intentionally shot himself once in the chest with a large-caliber handgun, but investigators were unable to turn up a motive. Investigators found no suicide note, history of mental illness or evidence of financial or criminal trouble that might lead someone to take his own life. 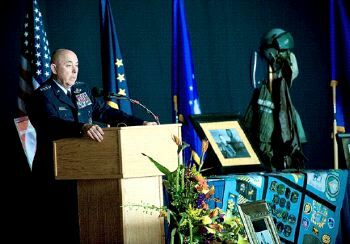 Tinsley was commander of the 3rd Wing at Elmendorf Air Force Base, Alaska, when he was found dead in the basement of his home on base. An autopsy and toxicology report found alcohol in Tinsley’s blood, according to an Air Force official, but investigators were not able to determine whether the alcohol was a contributing factor to his death. The Air Force declined to release the specific blood-alcohol content. No other substances were found in Tinsley’s body, according to a press release from Pacific Air Forces. Investigators determined the cause of death was one gunshot wound to the chest with Tinsley’s personal weapon — a Smith & Wesson Model 500 .50-caliber revolver, which the manufacturer touts as the world’s most powerful revolver. The five-chamber weapon, found with Tinsley’s body, contained one spent shell casing and four empty chambers. The new wing commander, Colonel Tom Bergeson, held commanders’ calls on base November 6 to explain the investigation’s findings to his airmen. Tinsley, who served 24 years, was seen as one of the rising stars of the Air Force. The F-22 pilot was promoted below the zone multiple times, had served for 22 months as then-Chief of Staff General T. Michael Moseley’s handpicked executive officer, and had a plum assignment as commander of the 3rd Wing. Those who knew him well would not have been surprised to see him become a three- or four-star general. 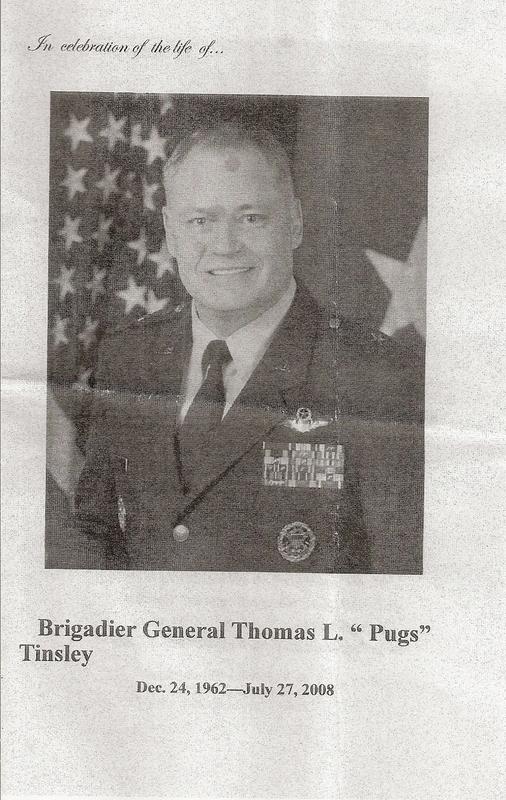 Givhan, who taught Tinsley to fly in 1984 at Columbus Air Force Base, Mississippi said it was immediately clear to him that Tinsley — call sign, Pugs — was something special. But despite that dazzling success, Tinsley also was known as an airman’s general — devoted to the well-being of those who served under him. Affection for Tinsley extended to the most junior ranks at Elmendorf, said Airman 1st Class Richard Hernandez, who worked on Tinsley’s staff. The esteem in which Tinsley was held made his death all the more shocking. Tinsley’s college-age daughter, Eden, called the command post between 10:15 and 10:20 p.m. July 27 to report that Tinsley had been found in the basement of the family’s home with a gunshot wound. The dispatcher immediately called Colonel Eli Powell, the 3rd Medical Group commander and an orthopedic surgeon. He ran from his house to the general’s home, just a couple of houses away, and was the first to arrive on the scene. Colonel Richard Walberg, the deputy wing commander, arrived at Tinsley’s house a minute or two after Powell. Medical responders, emergency personnel and security forces airmen arrived shortly after Walberg. Powell’s efforts to resuscitate Tinsley failed, and the 46-year-old general was declared dead at his home about 10:30 p.m. His body was taken to the base hospital. Moseley, visibly shaken, spoke at Tinsley’s memorial service at Elmendorf. 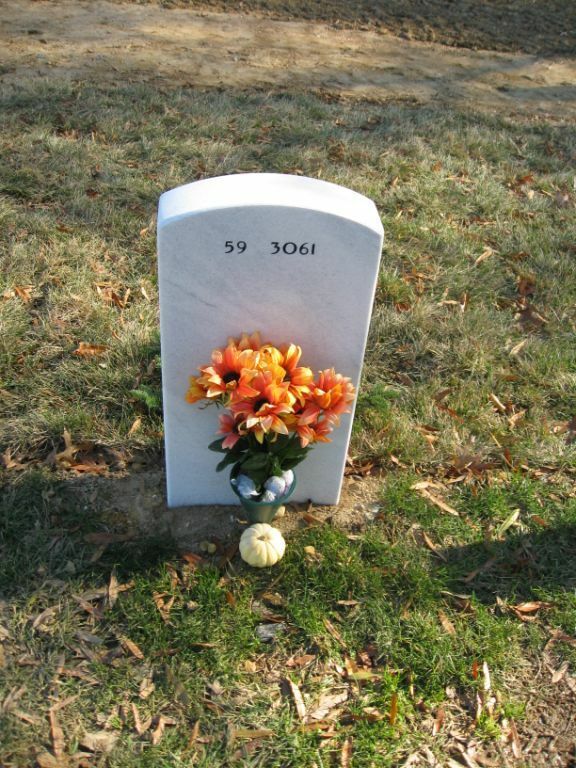 Tinsley was buried at Arlington National Cemetery. Air Force officials hoped the investigation would help Tinsley’s family, friends and fellow airmen understand why he killed himself, but that now appears unlikely. “One of the many tragic aspects of this event is that we are unlikely to ever fully understand his actions that evening,” Pacific Air Forces commander General Howie Chandler said. Pallbearers from the U.S. Air Force Honor Guard accompany a caisson bearing the casket of Brigadier Gen. Thomas L. Tinsley at Arlington National Cemetery September 10. General Carrol H. "Howie" Chandler presents the flag to Joanna Tinsley, wife of Brigadier General Thomas L. Tinsley at Arlington National Cemetery September 10.